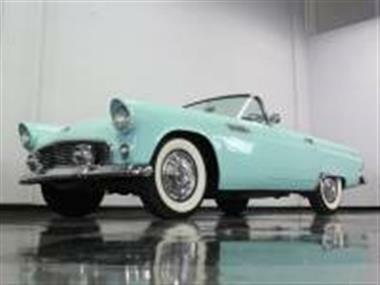 1955 Ford Thunderbird in Fort Worth, TX for sale. 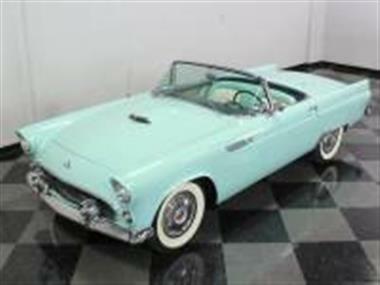 The 1955 Ford Thunderbird was a game-changer. 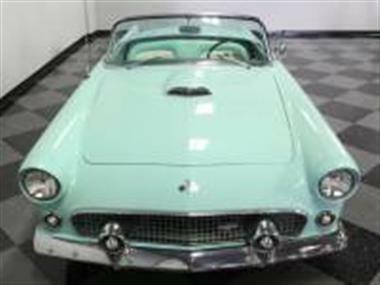 Sureand#44; the Corvette set the stageand#44; but the Thunderbird introduced the personal luxury carand#44; a concept that has proven remarkably durable in the 50-odd years since its introduction. 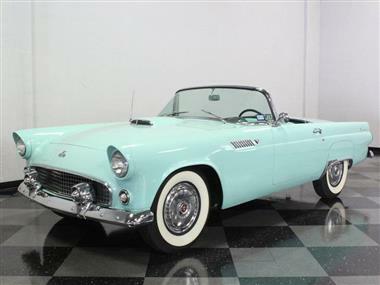 This lovely 1955 T-Bird shows you why these are such enduring favoritesand#44; and why no collection is complete without one today.<br /> <br /> If you ask someone to close their eyes and think of a Thunderbirdand#44; this Thunderbird Blue roadster is quite likely what theyll imagine. Beautifully proportionedand#44; neatly styledand#44; and with neat little details throughout that told the world that Ford was serious about their 2-seater. This one was restored years ago and has seen some use since thenand#44; but you really cant go wrong with an early Bird. The paint has a soft pastel lookand#44; perfect for the 1950sand#44; and while it shows a few nicks and bumpsand#44; none of it detracts from the pure fun this car represents. It was done in lacquer (eight coats according to the seller)and#44; so its got the right shineand#44; but you need to take care of it because its not as durable as the modern stuff. The 55s trim proportionsand#44; simple linesand#44; and lack of extras make them a favorite among collectorsand#44; and its easy to see why. The chrome shines up welland#44; and those details I mentionedand#44; including the hash marks on the fendersand#44; the hood scoopand#44; and jet-inspired taillightsand#44; are all in excellent shape.<br /> <br /> Turquoise and white is the theme insideand#44; tooand#44; where youll find an interior with the right look. 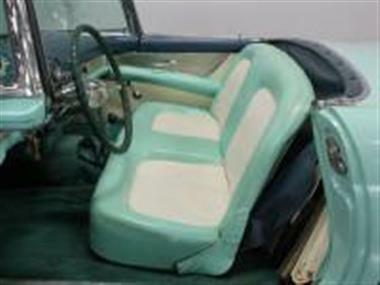 The two-tone bench seat shows some normal wear and tear but no rips or tearsand#44; and better yetand#44; its power actuated! The gauges appear to be a combination of original and new piecesand#44; although the speedo and tach are off line at the moment. The original AM radio is still in the dashand#44; but somewhere along the lineand#44; a modern AM/FM/cassette head unit was stashed under the dashand#44; and thats what youll listen to when you go cruising. Theres also a period under-dash A/C system thats been converted to R134a refrigerantand#44; so a recharge will be quick and easy. And heres an unusual fact: you could have either a folding convertible top or a removable hardtop at no costand#44; but getting both was extra. 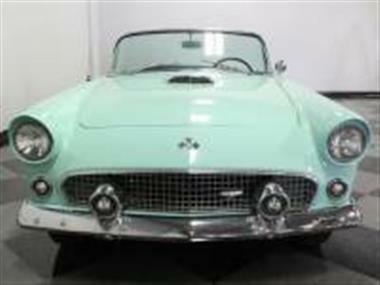 Youre in luck here because the original buyer of this Bird ordered bothand#44; with the hardtop being a correct non-porthole unit while the white folding top is older but in good condition. 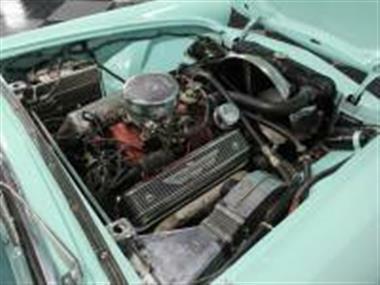 The trunk is finished with matching turquoise carpets that are a little dressier than the usual matsand#44; and includes a full-sized spare tire.<br /> <br /> The only engine available in 1955 was a P-code 292 cubic inch Y-block V8and#44; which when linked to a 3-speed manual transmissionand#44; makes 198 horsepower. Rebuilt and detailed when the car was restoredand#44; it fires easily and wears a proper Thunderbird dress-up kit that includes a chrome air cleaner and those gorgeous finned cast aluminum valve covers. Ford Red paint on the block still looks good and the unusual air cleaner makes use of the hood scoop for fresh air. Yesand#44; its a little scruffy and theres some extra chromeand#44; but its ready to driveand#44; not hang around on a show field. Underneathand#44; its probably original and in good orderand#44; and includes a new gas tank hanging out back and a dual exhaust system that exits under the bumper instead of through the bumper guards (which protects the chrome). 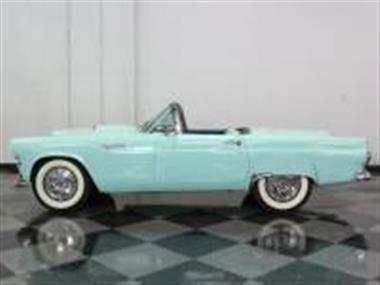 Recent 15-inch whitewalls have been fitted and wear full wheel covers that look appropriate.<br /> <br /> A first-year Thunderbird is something that every hobbyist should experience. This one isnt perfectand#44; but it looks great going down the road and comes with a great paper trail with receipts. Call today!